My son is a summer baby and every year for the past 5 years we have had amazing outdoor birthday parties and thankfully the weather has always held up! Since Easter he has been planning this year’s party. All he wanted was a BBQ, his buddies and a water fight – perfect for a July birthday! The weather has been great so far this summer (for the most part anyway) but as it drew closer to his big day the weather forecast looked increasingly depressing – rain, rain and more rain was predicted. I anxiously tracked the weather everyday on my phone hoping that the rain would not come! Guess what – it didn’t – yaaaaaay! We woke up early on the morning of the party to torrential rain but according to my weather app he said it would clear by 11.00am and it did! 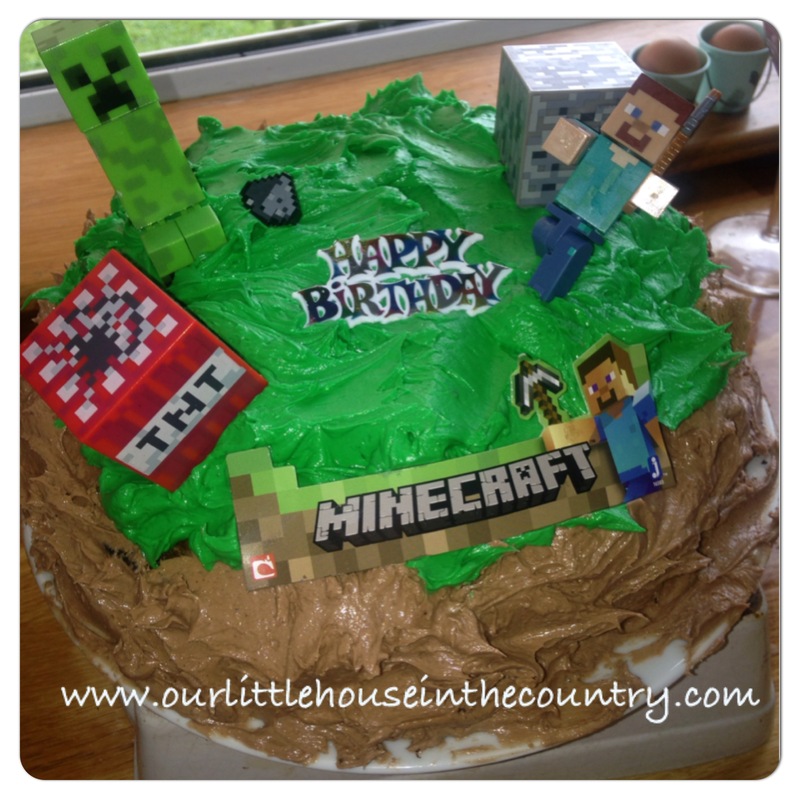 As an aside, I made a Mincraft cake, from scratch for the big day and the cat ate it!!!!! So I got up at 6.00am (usual time except for Saturdays!) to make another – was delighted with my masterpiece and then proceeded to forget all about it – we were having so much fun that I totally forgot to take the cake out. Thankfully, we had a cake the day before on his real birthday so at least he got to blow out candles – a week on and I’m still very annoyed with myself for forgetting to take the cake out!!!!!!! Unfortunately at least 4 of the invited kids had contracted Chicken Pox so were unable to attend the party but despite our reduced number we had a really great time. The parents mingled on the patio, Mr G manned the BBQ and I, the big kid, happily organised all of the water games (I spent many a happy hour on Pinterest, scouring for water party ideas). These are the ones we tried at the party! (We also played many traditional party games which we have listed and explained in our Top 10 Party Games for Younger Kids). Drip, drip, soak/dunk! : This is Duck, Duck, Goose, except with a wet sponge or cup of water – I found this idea on Parties 4 Me. Waterballoon toss: we used our Little Tykes adjustable basket ball net (various heights for little people) and each child tried to toss their balloon into the net. They got adventurous and took it in turns standing under the net waiting for the balloons to burst on top of them!!!! We also set up a basin for Oodles (2y.o) and her buddies to throw their balloons into! Water bucket relay: We lined the kids up in two teams. Each team had a small bucket. About 100m away we had two basins placed on the ground. The race started at the paddling pool, each child filled their bucket, ran up to basin, emptied bucket, ran back to team, next kid filled up their bucket and continued on until the basins were full! Pass the giant waterballoon: The kids made a large circle and I filled a normal balloon with lots of water to make a giant wobbly water balloon. The kids then threw the ball to each other across the circle trying not to burst it – creates a huge splash when it bursts! Water pistol battle: Each child brought their own water gun and I had bought a few extras in a discount store. We had only one rule for the party, well actually two! Number one was “only aim for below the waist with the soakers – no faces/heads”, number 2 was “have lot’s of fun”. (I texted the parents ahead of the party to tell them that we were going to encourage the kids to only splash/aim for the other kids legs with the water pistols and balloons, especially as most of D’s friends were bringing along their younger siblings to play with O. There was an all out battle with the water guns – everyone was soaked! Waterballoons: The night before the party I filled 150, yes, 150 waterballoons in preparation for the festivities. I had to place a net over these for the start of the party as the kids were itching to get at them but we needed a few for some of the other activities. Once they were let loose with them the real fun began! They managed to throw and burst every single balloon in no time at all and thankfully some of the parents kindly filled a few more! Our garden is still covered in little burst balloons. 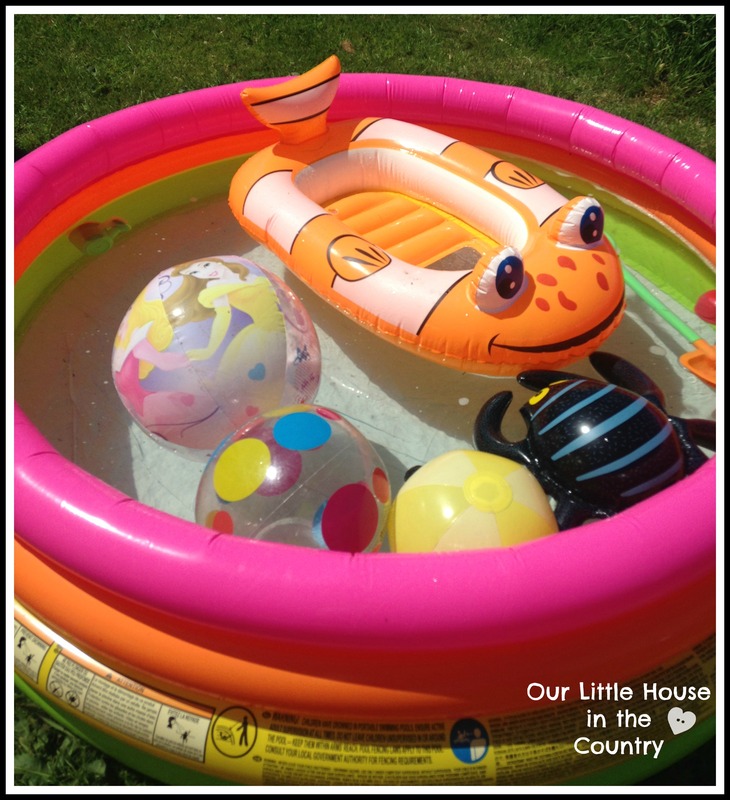 Chilli’n in the paddling pool: We had a small inflatable boat, several beach balls and other inflatable toys floating in the paddling pool and many of the children had alot of fun just hanging out, floating and splashing in the pool! 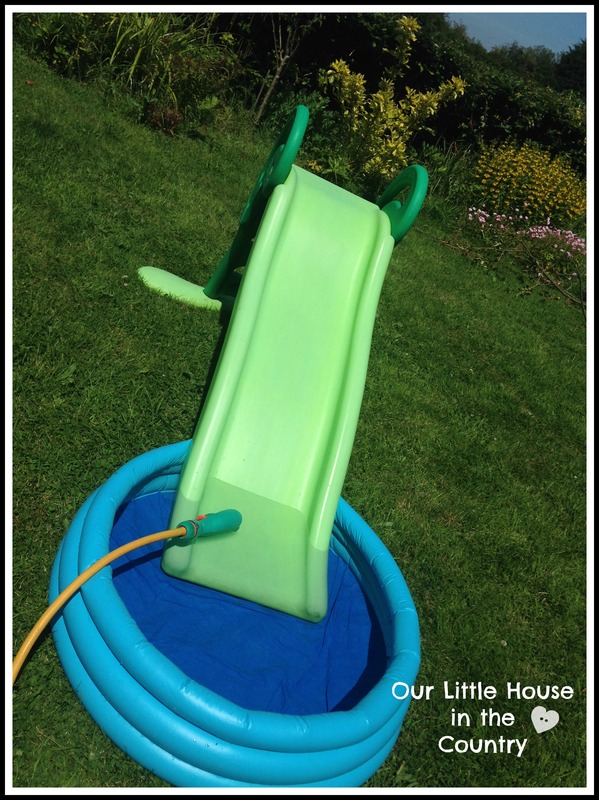 Waterslide: We placed our slide so that the bottom was in a small paddling pool and the little kiddies,especially, had a lot of fun going up and down our mini water slide! What’s inside the giant ice cube? : We didn’t get around to this on the day, but D and O thoroughly enjoyed this activity a few days ago – you can see all the fun they had with it in our Giant Ice Cube post! Pass the water cups down the line: For this game, the kids lined up in two teams again. The first person in each line is given a cup of water and they must pass it over their head to the teammate behind them continue down the line. The last child empties it into a bucket. The race continues until a team fills their bucket! Thankfully each child had brought a towel and a change of clothes and these were all needed. Once everyone had changed into something dry we had a lovely feast of burgers, sausages, chicken kebabs, fries, pasta salad, etc. The party was a great success and D was delighted with the way it all went! We were thoroughly exhausted following it even though it was only 2 hours long!!! I have 100s of waterballoons left to fill (I haven’t told D and O about them)! Let me know if you have any great ideas as to what we could use them for! I have an art activity lined up for some of them next week, yes I am going to add paint to them and allow D and O to fire them in the garden onto a large sheet – looking forward to that, check back and see how we get on! Would love to hear your ideas for the rest of them though! 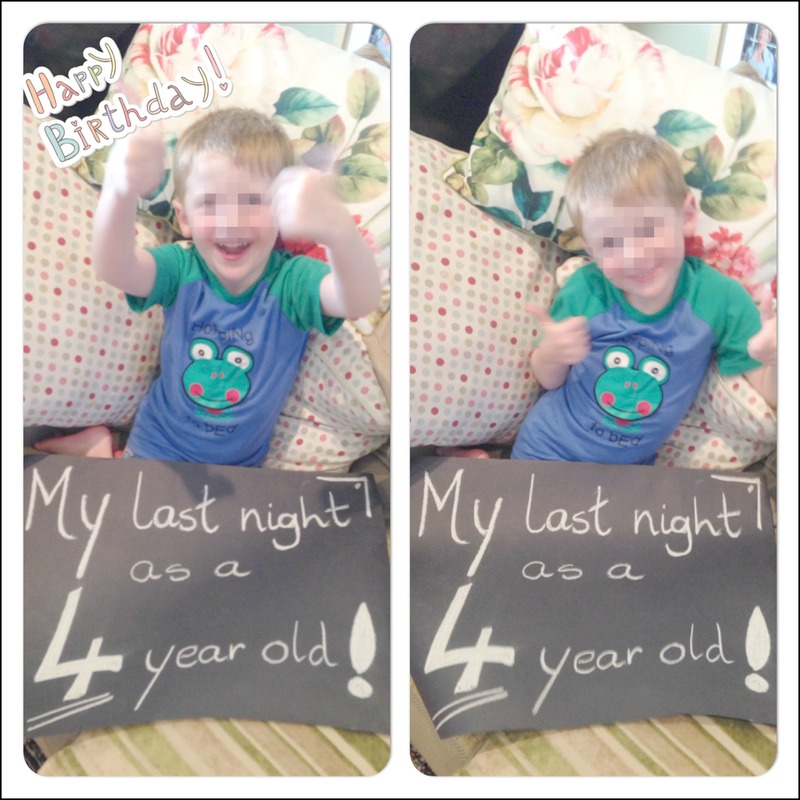 PS – Meet the birthday boy – this is a little tradition that we started a few years ago, on the eve of their birthdays we take a photo of them holding a sign. We also do it at the beginning and end of each school year! Thanks m’dear! I had a bit of fun playing around with new design on Saturday! Think I’m happy now! Few little tweeks and I should be finished it. Looks like a fun party theme! Your cake adventures sounds like something that would happen to me, made me smile. Happy birthday to your big 5-year-old! I’m so glad that it was sunny for the water themed party! I must say we have had many birthdays that have always resulted in the children having a water fight with children bringing their own water pistols in anticipation. What a shame about the cake – it looks brilliant. Thanks for linking up and sharing with Country Kids. Thanks Fiona, to be honest, whether it rained or not I say they would have had that water fight!!!!! Thanks for hosting yet another great Country Kids! 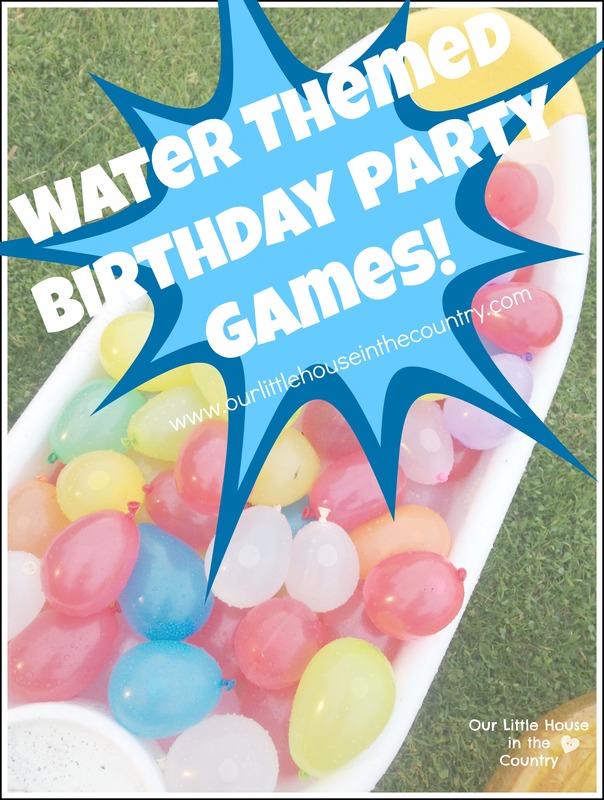 I love all the fun water themed birthday game ideas. I pinned it. Thanks for sharing. Thank you! Pity I forgot about the cake though!!! We had really great fun! Thanks for visiting! I was soaked and my back was broken from filling them!!!! We got this great little thing that screws onto the outdoor tap for filling the balloons- it’s like a plastic bottle top with a little funnel- came with the balloons, made filling them a lot easier! Thanks for visiting! Happy birthday to your son. It sounds like the best party ever! Great ideas there. It has reminded me to go and buy some water balloons for the summer. Great cake, even if you forgot to get it out. Thank you, it was really great! Still kicking myself over the cake! Thanks for visiting and for hosting! 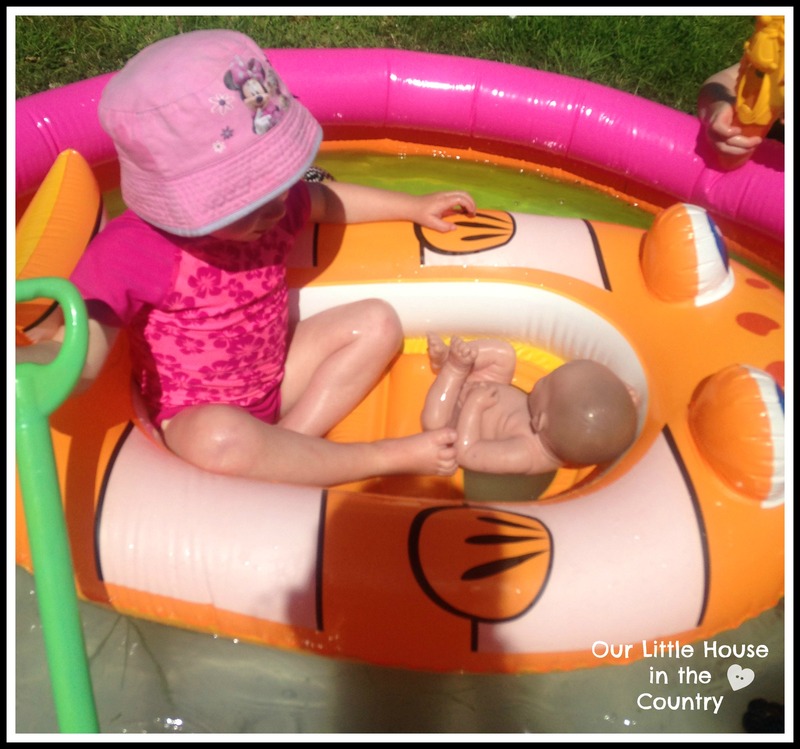 Brilliant ideas here – why is it children love water so much?! Thanks Paul, I must admit I think I may have had as much fun as they did! The water slide provides hours on entertainment in this house! My 2 1/2 yr old has actually been up and down it like a yoyo since 9.00am today!!!!! The games were perfect for a summer birthday- so much fun! Thanks for stopping by. Saw this over at Let Kids Be Kids link up. We are getting ready to have an Under the Sea party for our 1 year old and are going to have lots of water fun outside too. Love all these great ideas! Found this at the Let Kids Be Kids link up. We are getting ready to have an Under the Sea party for our 1 year old and will have lots of water fun outside too. Love these ideas! Oh that sounds lovely! Hope you have a great party! Thanks for stopping by! What a fun, fun collection of ideas. I am glad you linked up at Mom’s Library this past week, and I hope you’ll join us again this week. 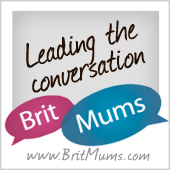 I’ll be featuring your post and pinning it now! Wow – this looks like such a fun party. Love all the ideas! I really wish now that my son’s birthday was in the summer so we could plan something like this. Thanks for sharing with the Love to Learn Linky Ciara!